The ocean is becoming a noisier place due to increased greenhouse gas emissions, California and Hawaii scientists report. Rising atmospheric carbon dioxide absorbed by the oceans not only has increased seawater acidity but has affected its acoustics—making it more transparent to low-frequency sound, the scientists said in a study published in the journal Nature Geoscience. 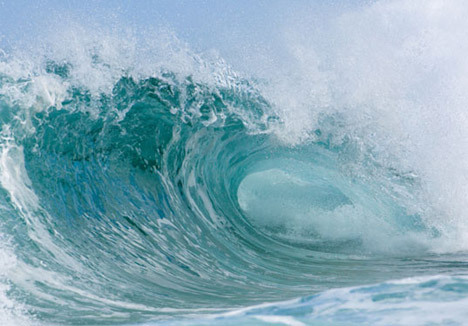 Scientists said seawater sound absorption will drop by up to 70% this century. “It was surprising to us,” said Richard Zeebe, an associate professor of oceanography at the University of Hawaii School of Ocean and Earth Science and Technology. Increased atmospheric carbon dioxide dissolved in the oceans increases acidity, or hydrogen ion concentration, and as the acidity rises, it lowers the seawater pH (a measure of acidity), researchers said. Not all frequencies will be affected, he said, explaining pH changes mostly affect sounds in the lower frequency range. SOEST researcher Tatiana Ilyina said the pH of surface seawater will drop by 0.6 units by the year 2100 at the current rate of carbon dioxide emissions, with a one-unit drop of pH representing a tenfold increase of acidity. “As a result, the absorption of 200 Hz sound would decrease by up to 70%,” she said, noting the middle C of the piano is tuned to 261.6 Hz. Sound around that frequency is produced by natural phenomena such as rain, wind and waves, and marine mammals and manmade activities, she said. Naval, commercial and scientific activities use low-frequency sound and marine mammals rely on low-frequency sound to find food and mates, the scientists said. “As a result, ocean acidification may not only affect organisms at the bottom of the food chain by reducing calcification in plankton and corals, but also higher tropic-level species, such as marine mammals, by lowering sound absorption in the ocean,” they said. Zeebe said: “The consequences of these changes on marine mammals is not well known at the moment. There is a lot of background noise in the ocean generated by humans—ship noise, construction, seismic surveys and sonar—and this noise will essentially increase in volume in the ocean in the future. Another possibility is that marine mammals may be able to communicate over larger distances in the lower frequency range if sound absorption is decreased because underwater sounds can travel farther than at the surface, he said. “Also, there are commercial and scientific applications, seismic surveys, that probably will have to take into account that future sound propagation in the ocean will slowly change,” Zeebe said, adding that more study is needed to determine the effects of the ocean acoustics changes. About 30 pilot whales died after they became stranded on Coromandel peninsula yesterday and will be buried by the local Maori. 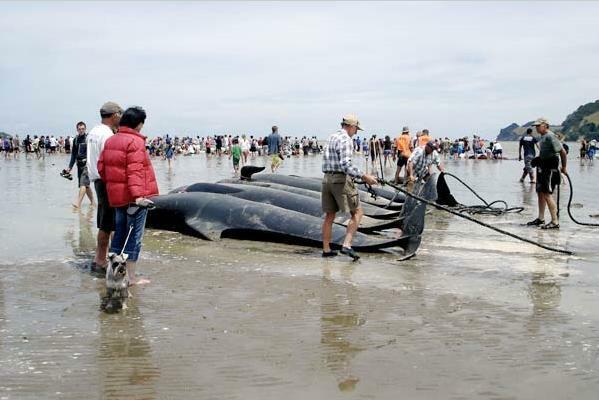 Meanwhile, up to 120 long-finned pilot whales, both calves and adults, were found dead at the Farewell Spit on Boxing Day. “More offshore wells have been drilled in the last two years than the rest of the decade combined: 35 on and offshore wells were drilled between January 2008 and July 2009 alone,” said a report. Each year about 2.5 million tourists visit New Zealand, straining its fragile ecosystems to the breaking point, creating a massive litany of different types of pollution, including noise. Environmental experts are studying numerous cases of beached whales and dolphins that are believed to have been caused by sound pollution, according to Simmonds. Just two weeks ago at least five whales died after nine were beached in Mediterranean off the southern coast off Italy, an unusual place for whales to beach themselves. ‘A massive beaching is extremely rare in the Mediterranean,’ biologist Maurizio Wurtz at the University of Genoa said. Noise pollution from seismic surveys for oil and gas as well as naval activities are believed to have confused whales by interfering with their communication, thus leaving them stranded and ultimately dead, many Conservationists and biologists say. The International Fund for Animal Welfare (IFAW) says man-made ocean noise inhibits cetaceans’ communication and disrupts their feeding. Among other actions, the recovery plan mandates that the Fisheries Service identify and implement methods to eliminate or reduce blue whale mortalities from ship strikes. 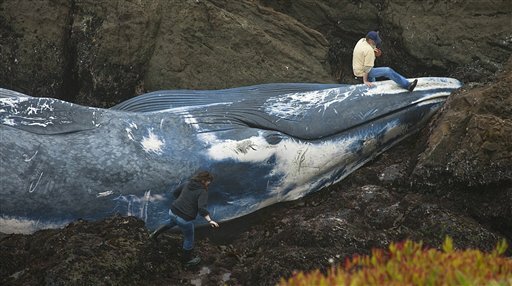 According to the groups, the agency has failed to carry out key provisions of the plan intended to both minimize and eliminate threats caused by ship strikes, pollution, and other harmful activities, as well as to improve the agency’s limited knowledge concerning blue whale populations and habitat needs. Driven to the brink of extinction by whaling in the mid-20th century, blue whale populations have begun to slowly increase in many areas, and the species is now sighted during the summer along many areas of the California coast. While these increased sightings are cause for optimism, blue whale population numbers remain at a small fraction of their historic levels — today’s global population is estimated to be 10,000 animals, compared to a population of at least 350,000 before whaling. In addition, the species is now confronted with a host of new and emerging threats, including not only ship strikes but climate change, ocean acidification, and noise pollution. Blue whales are the largest animal to have ever lived on Earth. The average adult blue whale is almost as long as a Boeing 737. They live more than 50 years for certain and could live as long as 90-100 years. They live in all oceans and migrate, travelling thousands of miles each year. It is known that the Santa Barbara Channel hosts the largest seasonal population of blue whales. Under the Endangered Species Act, potential litigants must file a 60-day notice of intent to sue before lawsuits can be filed alleging that the government has failed to carry out its nondiscretionary duties under the Act. While the conservation organizations are committed to pursuing legal remedies if necessary, it is their hope that submission of the notice will prompt the Fisheries Service to begin implementing the Blue Whale Recovery Plan without court intervention. “Though unable to move the blue whale, scientists and students are leaping at the research opportunity, scrambling down rock faces to take tissue samples and eventually one of the 11-foot-long (3.5-meter-long) flippers,” according to an article at National Geographic. Local environmentalists and fishermen have decided to name the dead whale “Jane” after Jane Lubchenko, the NOAA administrator who is running the federal fishery “management” scheme that resulted in the whale’s death. The RFA, Ocean Protection Coalition and other conservation groups have asked for a suspension of the MLPA process, due to lack of dedicated funding, numerous conflicts of interests by MLPA decision makers and the lack of clarity about what type of activities are allowed in reserves. This tragic incident only highlights the urgent need to suspend the corrupt and out-of-control MLPA corporate greenwashing process that is opposed by the vast majority of North Coast residents. Everybody who cares about the health of our oceans and coastal communities should support a full, independent and impartial investigation of the killing of “Jane ” the whale by a NOAA contract boat. At the same time, the MLPA process, rife with conflict of interests, mission creep and corruption of the democratic process, should be immediately suspended.